Majora’s Mask is unquestionably a classic. It was released more than a decade ago on a console that’s now firmly cemented in people’s memories. It was the sequel to one of Nintendo’s greatest success stories, and it has been hailed by the fanbase as one of the greatest titles in its series — praise that’s not unwarranted considering its quality. Considering its age and status, and the fact that it was only the eighth Zelda game ever released in what is now a 15-game series, it might also be tempting to think of it as a relic of a bygone era of Zelda games. There is, however, a fine line between the recently-released Skyward Sword and the classic Majora’s Mask, and it’s a line that seems to grow thinner the more we look into some of the fundamental ideas in these Zelda titles. A few weeks ago, I wrote about how instrumental Link’s Awakening was to the development of stories in Zelda games. If that’s the case, the transformation to the “modern” Zelda style may well have been fully realized over a decade ago. Majora’s Mask was the first Aonuma-led Zelda title. Having worked on Ocarina of Time’s dungeons, he stepped into the director’s chair for a project wracked with rigorous time constraints and a predecessor that was obnoxiously difficult to live up to. The differences in style from previous games, which will be discussed below, helped set Majora’s Mask apart. Before analyzing how Majora’s Mask affected modern Zelda titles, it’s a good idea to analyze how it developed on or differed from previous titles. Those differences are a large part of what makes Majora’s Mask so well-loved. In Majora’s Mask, story no longer takes a backseat. While Ocarina of Time was filled to the brim with cutscenes, Majora’s Mask places a far greater emphasis on its plot development. The first forty-five minutes of the game seem driven not by gameplay, but by the intensity of the game’s own harrowing premise. Link is funneled into a foreign world on the brink of destruction and given only a cycle of three days to save it. It’s this premise that every character, every cutscene, and every aspect of the game’s design addresses. In the first three-day cycle, we’re introduced not only to gameplay elements, but to several different plot elements at once. In Ocarina of Time and its predecessors, the story was presented through intermittent, short cutscenes. In Majora’s Mask, it is thrust on the player consistently through lengthy cutscenes punctuated with heavy dialog and through the conversations of the NPCs. If you have played through the game before, the premise and overall approach should be interesting enough to keep you playing, but in many respects, it also holds your hand, not letting you get too far in to the quest before ensuring that you understand some of the basics. These required tutorials and tasks, were arguably necessary because the mechanics are so complex compared to those in classic Zelda titles. You’re forced to juggle time limits and some outrageously difficult challenges, all while coming to grips with some of the new or more developed ideas presented in the game. Previous Zelda tutorials are necessary too, but they generally thrust you into the main game — or something resembling it — much sooner, or make more of the tutorial optional. So the opening sets the tone for the game, but it would be wrong to say you can learn everything there is to know about Majora’s Mask from the prologue. Once Link gets his sword and shield, the world spreads out before him and it seems as though he has much more maneuverability. …Well, it seems that way, but in execution, it’s a little bit different. Majora’s Mask was the first console Zelda to truly feel restrictive. 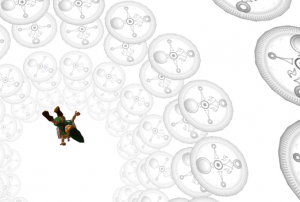 It took the circular design of Ocarina of Time’s overworld, for which each section was like spokes of a wheel, to the next level. Now, the field really is a circle, and each of the spokes is marked off by clearly elemental designs. Each path you can take is blocked off with obvious obstacles, and you’re forced to acquire new items to get past those obstacles. Once you get the items, it becomes immediately obvious how to move forward. 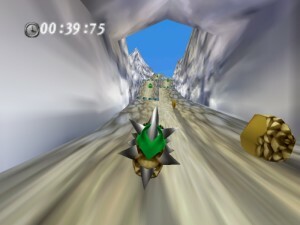 For example, a giant wall blocks off Great Bay; getting over it requires you to have access to Epona, which requires you to have access to the Powder Keg, and to get the Poweder Keg you need to follow a still longer and linear list of objectives starting from that first moment of completing the tutorial. There is a logical structure to this that’s all very easy to outline, but instead of being a short list, charting out the course to Great Bay requires charting out the course of the entire main plot to a point. Great Bay is halfway through the game; as such, it’s clear that there’s limited freedom. While you can complete dungeons out of order, grab the items in the dungeons, and progress through separate areas, this is heavily discouraged by the three-day time limit. Even if you reset the time after getting a dungeon item, you would lose all the fairies you collected (some of which are nearly essential for an easier experience) and progress through the game in an unnatural, illogical way. Thus, it’s not completely linear, but it does more than suggest a path for you to take; the game’s basic design funnels you in a particular direction. In classic Zelda games, you’re blocked from other overworld locations by strategically-placed rocks, Hookshot targets, warps, etc., all of which serve as doors unlocked by key items. The difference is that the path to acquiring those items might vary depending on the player. 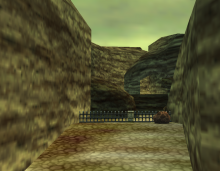 Since Ocarina of Time is the most restrictive of the older console games, there are certain parts, like the Shadow Temple, that might require access to a variety of other dungeon and overworld items acquired along a linear path. In Ocarina of Time, you’re encouraged to explore the Forest Temple, Fire Temple, Water Temple, Shadow Temple, and Spirit Temple, in that order. 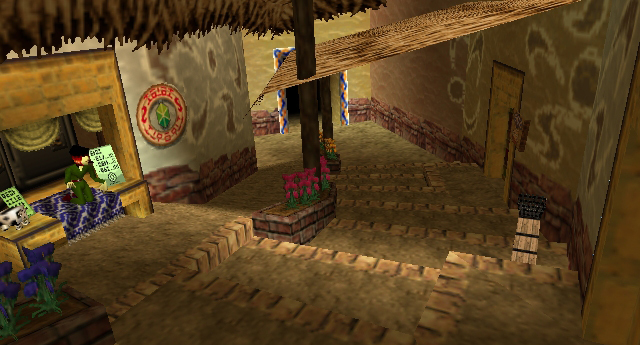 However, if you choose, you can complete the Fire Temple and the overworld portion of Gerudo Desert, which leads straight to the Spirit Temple, before even entering the Forest Temple. You can start dungeons out of order, which is totally different from Majora’s Mask. There are a number of possible configurations, and many different ways to explore the overworld, some of which are obvious and some of which are not. Several previous console Zelda games, particularly The Legend of Zelda, A Link to the Past, and Ocarina of Time, either had a truly open world or at least had the illusion of openness. Between the three games, each became increasingly restrictive, but at some point in each, you could expect to be presented with more freedom. This was at least partly due to the abundance of dungeons. All three of the games had a wealth of dungeons, with A Link to the Past taking the cake for the most. While Ocarina of Time and A Link to the Past were both split in two by a light world/child section and a dark world/adult section, even the early parts were open to a point, and the core design of the game did nothing to make them feel restrictive. Even Zelda 2, which had a somewhat more linear overworld design, felt relatively open and truly presented the player with numerous options about how to approach their quest. Worth noting is Link’s Awakening. It’s strictly linear, and it doesn’t allow much deviation from its main path. It takes a different approach from earlier Zelda games, but it is the first of its kind in the series, and it proves that it can work. That said, while Majora’s Mask’s structure may spring partly from Link’s Awakening’s, it more closely follows after the series’ previous home console titles, so to some degree Link’s Awakening is unattached. While many gamers, especially Zelda fans, might think a more linear game bad thing, it’s not necessarily. As previously stated, the progression of Majora’s Mask is logical. This is a good thing considering how complex the mechanics are. Even in spite of the logical progression through the overworld, many gamers complain of the difficulty imposed by the three-day time limit; imagine those gamers also stumbling through the overworld without a clear sense of direction! Majora’s Mask has great exploration, but it doesn’t encourage large-scale exploration the way classic Zelda games did; it’s more intimate and restricted to smaller areas. It doesn’t just play out this way because of more complex mechanics, though: There are fewer dungeons, which means fewer checkpoints, which means fewer options for the player about how to progress. Furthermore, even though each “section” of the game has a self-contained plot, the focus on story can play a role in a more restrictive design. Why have the player juggle four separate plotlines when the developers clearly want to create an atmosphere of intense claustrophobia? The irony of this is that, in spite of its sense of claustrophobia, overworld exploration is emphasized over dungeon-crawling; but it’s less traditional in its approach, favoring linear progression through large areas, probably carried over from Ocarina of Time. As the structure narrowed in some areas, it expanded in others, leaving a tight, well-constructed experience. Sidequests allow the player to branch out from the linear story. Classic Zelda games had sidequests, but for the most part, they didn’t involve heavy NPC interaction. The longest sidequest in Ocarina of Time gave you the Biggoron’s Sword. A Link to the Past also had various sword upgrades, but they were driven by simplistic NPC interactions and more heavily integrated with progression through the overworld. Item expansions were a byproduct of exploration. In Majora’s Mask, sidequests are integrated more effectively into the main story — with most, if not all, referencing the three-day cycle — and offer basic items like Pieces of Heart which were formerly acquired with more simplistic interaction with the world. This may be a byproduct of the focus on plot and complex mechanics; there are more options to draw from in terms of interactions with NPCs and the general approach to sidequests. Since exploration isn’t emphasized quite as heavily in Majora’s Mask, but story is, it made sense for them to take this approach. This may be a way of compensating for the linearity. With the exception of Link’s Awakening, a more open structure correlated with more dungeons in previous Zelda titles. With fewer dungeons and fewer options for deviation, sidequests provide an outlet and open up the world. It’s a novel approach for a Zelda game and a welcome addition. Those who complain about gimmicks in modern Zelda games clearly don’t have an understanding of series history; even A Link to the Past was driven by and patterned around its central gimmick of the Light and Dark Worlds, and Ocarina of Time was structured around a similar gimmick of time travel. Majora’s Mask takes this to the next level, however. While the Light World/Dark World and time travel of previous games were heavily integrated into gameplay, they don’t feel nearly as imposing as the three-day cycle in Majora’s Mask, which is a constant, inescapable source of tension in the gameplay. 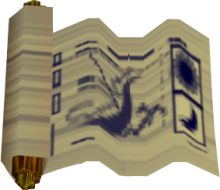 In Ocarina of Time, you time travel at certain key points; in Majora’s Mask, you actually have to pattern your decisions around essential time travel, choosing whether to tackle a dungeon or set into motion a new chain of events on the third day. Even sidequests are based around certain times of day. The Anju and Kafei sidequest is notable for this. Since sidequests are especially robust, you’re never allowed to forget about this mechanic. But items are also essential. The Deku, Goron, and Zora masks act as expansions on classic items. The Zora Mask, for example, serves as a Boomerang alongside its other functions. Each also serves as a method of transportation — chasms or bodies of water that otherwise can’t be crossed can be with proper use of masks. Since a mask also takes a central role in the plot, and since you’re constantly swapping between masks, these serve as a central gimmick just as much as time travel does. Unlike items, they don’t just unlock one type of action; they feel like entirely new characters central to the game, and they also affect how you interact with NPCs and what sidequests you can access. Their scope makes them entirely different. The sum of these changes is a game that plays differently, but still feels like Zelda. It offers less freedom in terms of plot progression, instead making the plot itself more central, but also offers more distractions — more things to do when you’re not advancing the plot. Synergy between gameplay and plot are fortified. In other words, it was a logical next step, but one that changed the blueprint just a little bit. And we’re still feeling the shockwaves today. Consider the next console title, The Wind Waker. It, too, was bound by a linear narrative, featured fewer dungeons than early Zelda titles, focused more on overworld exploration than dungeon diving (much more, in fact), and was tightly bound by its central gimmick: Sailing. Much as masks and the three-day cycle were always at the center of Majora’s Mask, the Great Sea and wind permeated every aspect of The Wind Waker’s design, right down to the graphical presentation. It also had an even longer opening than Majora’s Mask, with complete freedom granted to the player hours, not minutes, after starting the game. The Wind Waker looks like another leap in mechanics, and it may well have been, with its two DS successors playing upon some of the same ideas. More importantly, though, it is a logical next step from Majora’s Mask, and it’s quite clear that The Wind Waker could never have happened without the previous console title. What is Windfall Island if not a sequel to Clock Town? As with Clock Town, its residents go about their daily business, timed to precise schedules, and present Link with a myriad of distractions. And while The Great Sea is in some ways Termina’s opposite, progression from one area to the next is handled in much the same way. The point A to point B to point C progression is far more pronounced than the older games, and once again, you can chart the main plot’s course in a straight line. The Triforce quest is about the only non-linear thing about the main quest — it exists separately from dungeon progression for the most part. Of course, the Great Sea also offers its share of distractions, and more traditional Zelda exploration is married to Majora’s Mask’s sidequest focus in quests that span several different islands. This even carried over into the handheld titles. 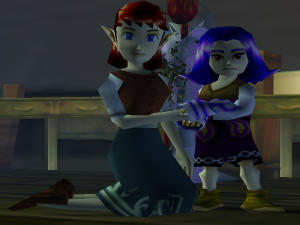 While the Oracle games followed Link’s Awakening’s pedigree, The Minish Cap also showed an emphasis on Majora’s Mask-like sidequests, an overworld focus, linear progression, and a persistent central gimmick. The DS titles, following in The Wind Waker’s footsteps, reflected a similar sensibility. Twilight Princess resembles older Zelda titles with its sheer number of dungeons, but sticks to linear progression. Skyward Sword follows the same pattern and also returns to the idea of a central city with a sidequest focus, which was missing in Twilight Princess. And while many of these games do reintroduce exploration to greater or lesser degrees, they also retain a form of Majora’s Mask’s NPC interaction for a number of their sidequests. These modern games, while springing from the same blueprints of the original Legend of Zelda and Ocarina of Time, have shifted focus away from some classic elements and toward newer ideas like sidequests and an overworld focus. Majora’s Mask was a clear indicator of things to come, and no one should be surprised by the modern structure of Zelda games. Hanyou has worked for the article staff, both as a writer and as an editor, for over a year. He has also been an active member of the Zelda Dungeon forums since 2008 and an avid fan of the Zelda franchise since 1998. He has degrees in writing.